I'm very happy to announce that we're only 35 puzzles short of 2,900! After that, there will only be 100 more puzzles to litz until we hit 3,000! In addition, we only have one more puzzle packet left in 1987! Since Barry Haldiman's CD contained so many puzzles from 1988 and 1987, we've been able to get through those years much more quickly than usual. If we continue litzing at this pace, we can be done with all the puzzles in just a few years! Today's featured pre-Shortzian entry is SIABONS. According to the Ginsberg database, neither SIABON nor SIABONS has ever been reused in a Shortzian puzzle. SIABONS originally appeared in the August 17, 1991, puzzle by Kevin Boyle, which was recently litzed by Jeffrey Harris. The clue for SIABONS was "Hybrid apes." Siabon is such an unusual word that it doesn't even appear in Webster's Online Dictionary! 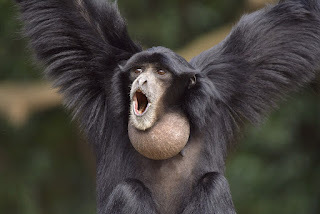 The World Book Dictionary, though, defines a siabon as "the offspring of a siamang (genus Symphalangus) and a gibbon (genus Hylobates): The Siabon combines the physical characteristics of both parents and has 47 chromosomes (Charles F. Merbs)." I couldn't find a picture of a siabon, so I'm posting pictures of a siamang and a gibbon instead—you can use your imagination! 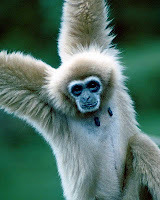 Images courtesy of Wikipedia (left) and the Primate Photo Gallery (right). APTERYX isn't bizarre for those of us who (ahem, are old enough to) remember the B.C. comic strip. The character would often introduce itself by saying "I'm an apteryx, a wingless bird with hairy feathers."